For almost three decades, Sweethearts Three has been creating one-of-a-kind holiday gifts for financial and insurance industry clients, physicians, printers, jewelers and many other businesses. All of our clients have similar goals - to reward employees, to impress clients, or to show loyalty to customers - and we help them achieve these goals with top quality chocolate gifts presented elegantly. What's more, we offer gifts to meet any budget. 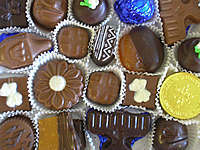 A one or two pound box of Sweethearts Three handmade chocolates - enough candy to get your clients through all eight days of Hanukah. Chocolate dreidels, menorahs and gold coins are at home among decadent truffles, succulent dipped fruits, chocolate cashews and creamy fruit crèmes. Colorful Hanukah wrapping paper and a big bow make the outside look almost as good as the inside. 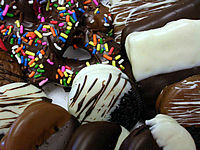 A one or two pound box of Sweethearts Three handmade chocolates will surely impress your clients or reward your employees. We incorporate some of our Christmas specialties, such as candy cane crunch, chocolate snowmen and Santas and colorful chocolate "presents", into our assortment of decadent truffles, chewy caramels, chocolate cashews and creamy fruit crèmes. Colorful Christmas wrapping paper and a big bow make a beautiful presentation. No matter the industry, we'll find a way to customize our hand-molded edible baskets for you. Chocolate shoes for a shoe manufacturer's rep; chocolate medical instruments for your referring physicians; scales-of-justice chocolate medallions for your lawyers - your customers and associates will really appreciate the creativity. In every case, the basket overflows with our assorted chocolates and is placed in a box and wrapped with designer gift-wrap and a coordinating bow. And if you simply want to say "happy holidays" to your clients or customers, we can do that too. 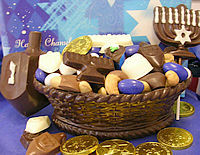 Chocolate turkeys and cranberry-orange bark rest atop the Thanksgiving basket; red and green foil-wrapped truffles, chocolate Santas and edible "presents" fill the Christmas baskets; and bite-size chocolate dreidels, menorahs and gold coins decorate the Chanukah baskets. Check out our Edible Chocolate Baskets for more details. Express your loyalty to customers. Show your appreciation for hard-working employees. Incentivize your sales force. Most importantly, let Sweethearts Three handle it for you all year long. 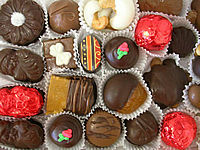 Quarterly Chocolate Baskets - $244 plus shipping. Our medium-size edible chocolate basket will be sent four times during the year. You pick the occasions and we'll customize the basket accordingly (e.g. Chanukah, Christmas, Easter, Passover, Birthday and Thanksgiving).